As stated, this pak will =only= work with a Full-4 Merged install, as it makes use of the Mirage5F lod from SF2:E, and the Nesher cockpit from SF2:I. Obvioulsly, if you have both of these, it'll work (ie: Full-4 merged is best!). 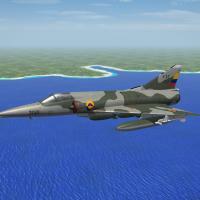 This mod represents Mirage 5(COA) aircraft from the Colombian Air Force, with historically accurate serial numbers. All loadouts use 100% stock, in-game items. The canopy has been activated via a manual animation key; use Shift/0 to open and close it. The data and userlist inis have been set to a 'single nation use only' type. Landing lights have also been added, for those pesky night flights. An SF2 style hangar screen is also included. As always, easy to folllow install instructions are included; so read and follow them! Let's hope THIS time, it uploads and downloads for everyone!